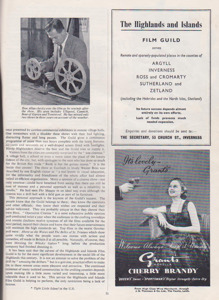 The Highlands and Islands Film Guild was based in Inverness and employed 14 driver projectionists and operated around the north and west of Scotland from 1946-1970. "The guy with the projectors was my father and he worked with the Guild from almost the beginning in 1946 until the end in 1970. The projectors used were Bell & Howell 16mm with a couple of Debrie d16 as used at the old CAC cinema at Tain after CAC had finished there. 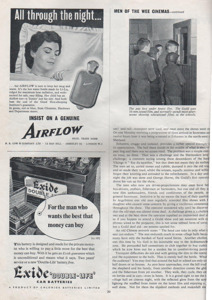 Each van carried two B&H projectors, two B&H 12" speakers and in the early days a screen, possibly about 8' x 6', but maybe even a little larger, plus all the other little necessities to carry out a show. 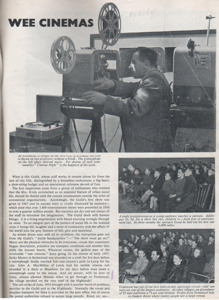 Films would arrive at the Inverness office and thereafter would be posted out to a projectionist who would pass on to the next and so on until it had travelled round them all. 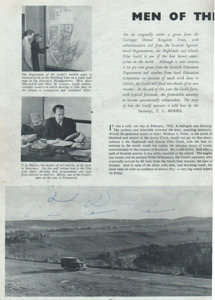 The magazine article was from Scotlands magazine in December 1955."